Yesterday it was announced that WakaWaka is named in the prestigious 2017 Global Cleantech 100. The Global Cleantech 100 represents the most innovative and promising ideas impacting the future of a wide-range of industries. Featuring companies that are best positioned to solve tomorrow’s clean technology challenges, the Global Cleantech 100 is a comprehensive list of private companies with the highest potential to make a significant market impact within a 5-10 year timeframe. This year, a record number of nominations were received: 9,900distinct companies from 77 countries. These companies were weighted and scored to create a shortlist of 325 companies. Short-listed nominees were reviewed by Cleantech Group Expert Panel, resulting in a finalized list of 100 companies from 17 countries. 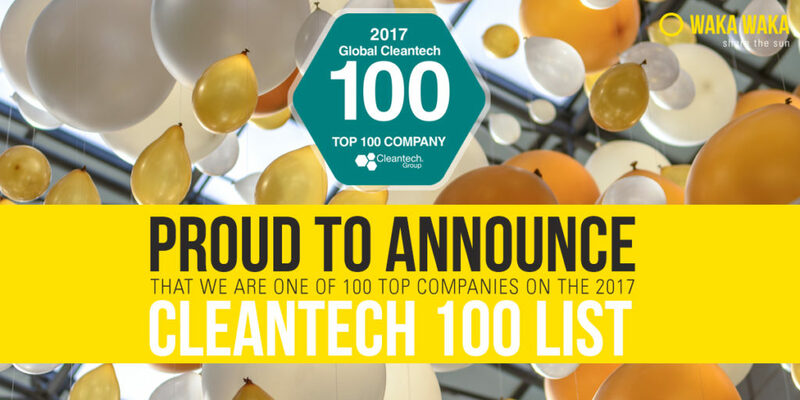 WakaWaka is scaling-up, and to be listed in the Global Cleantech 100 is a great recognition for the impact we made and aim to realize in the future. We will further develop and strengthen our distribution channels, all over the world. In the meantime, we develop new products and have the ambition to further grow our sustainable, and circular model. The full list of 100 companies was announced yesterday, on the 15th Cleantech Forum in San Francisco. The full list together with a detailed report with commentaries and insights can be downloaded here.